“I just wanted to write and tell you how much we enjoyed our golf holiday. As far as words of praise go, I am at a loss. 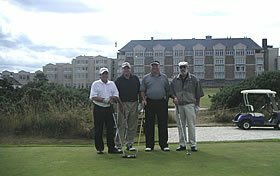 Golf Vacations UK did a wonderful job and was the epitome of good service and wonderful arrangements and I, for one, would never think of using any other company to plan a return trip. We enjoyed the Russell Hotel and all of our arrangements went without a hitch. I must say that of all my travels the golf industry in Scotland is the most hospitable I have ever run across. Nan from the vehicle rental company was helpful and timely and everything went off like clockwork for the entire trip. I have recommended you to several parties.